During a hurried rush through Lowe’s at the beginning of December, I came across a display of Amaryllis kits. They were cheap, easy, and would satisfy my need to do something interactive with my kids that didn’t involve glue, glitter, or anything else that would send at least one of them into tears and me to the liquor cabinet. I grabbed 3 boxes and headed home for some seasonal bonding with my boys. I was pleasantly surprised how excited they actually were about the project. Each picked a box and opened it up to pull out the little gold pot, the disk of dehydrated potting soil (at least I think that’s what it was) and their bulb. They immediately began to compare the bulbs to see who’s was biggest (apparently men start this behavior at even the earliest ages). 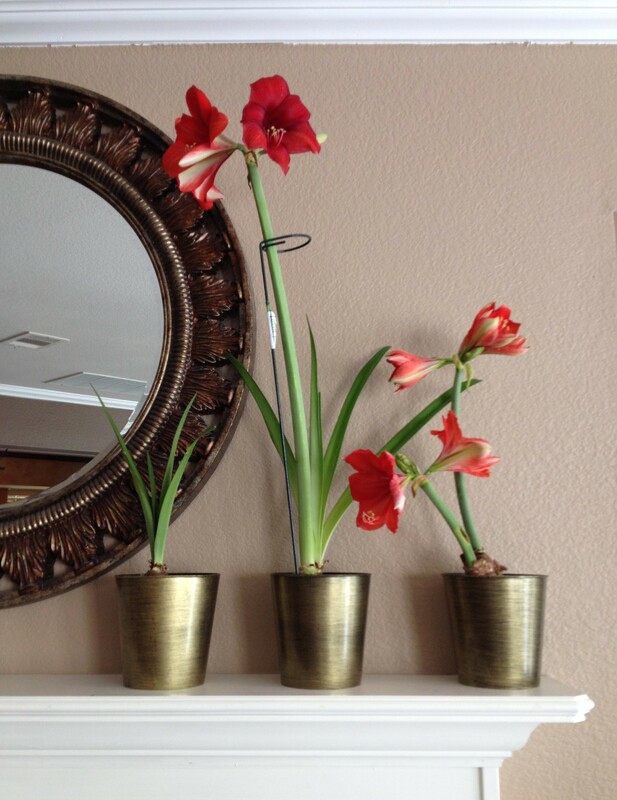 My oldest son’s bulb was the only one that actually had leaves already sprouting and this pushed him ahead of the other’s in the “King of Amaryllis” competition. I found myself secretly happy about his good fortune. You see, Carson is my autistic son and he always seems to draw the short straw in so many things. He’s even told me himself that he’s just “an unlucky guy.” It breaks my heart on a daily basis so when even the slightest break or advantage comes his way, I find myself thankful. So the boys get to work on putting their “dirt disk” in the pot and pouring water over it. They use a fork to break it apart and even I am a little amazed at how much soil is produced. We get the bulbs planted and line the three little pots on the window seat for some sun. We go about our business and let nature take over. The plants start to grow. The one belonging to my oldest son, Carson, grows first because of its headstart, but Max’s and Cole’s are hot on its heels. Within a matter of a couple of weeks, Max’s has shot up past everyone’s and Cole’s is the first to form a bud. Carson’s continues to stay in the same place, not wilting, not growing, not budding. This continues until the week after New Year’s when Max’s (that has grown so tall it requires a stake to stand up) blooms. Cole’s (that has grown a second stalk) also blooms; but Carson’s, the one that started out strong, stays in the exact same state it started in. This bothers me–a lot. I find myself giving his plant special treatment. I check its soil everyday and carry it from window to window for extra sun while I leave the other two on the mantel to fend for themselves. I talk to the plant. I take it outside. I give it extra water. I fret over it. I do all of this until I realize that I’ve come to think of this flower as a symbol of my son, an extension of him. I want the plant to thrive so badly because I want him to thrive so badly. I want him to be the “King of Amaryllis” just once in his life. This realization makes me step back and look at all three of the plants. The plant belonging to Max, my middle son, is the one that has shot towards the sky, full of life and drive. The multiple red blooms have exploded on the end of the stem like some sort of botanical firework. This plant has mirrored its owner. It’s showy and beautiful. It fought hard to earn the attention of anyone and everyone that steps in the room. The bright red blooms are loud and bright but they’re also soft and sweet. This showboat of a blossom gives this air of confidence by defying gravity, but it’s weaknesses show too. It’s balanced on such a long, thin stem that it leaves the flower very vulnerable and even requires the support of a stake to keep it standing. This flower is Max. He is the cute kid with the dimples, whose sense of humour keeps everyone laughing. He’s naturally gifted in sports, theatre and art. Everyone is drawn to Max. But he’s also dyslexic, has ADHD, and riddled with self-doubt and anxiety. He is always standing on a tight wire, exposed to the wind that can so easily dislodge him from his perch. It takes constant support to keep him reminded that he is amazing and beautiful, just like his flower. That leaves Carson’s flower; the one that’s breaking my heart. It looked like it had the most potential in the beginning. Even in the darkness of its box it had managed to sprout and grow despite its lack of water and sun. I’m baffled and unsure of what else I can do to get it past the point it has stayed stagnant at for the past several weeks. The plant is green and looks strong, so I just can’t understand what’s slowing it down. I finally remember that a strong claim was printed on the outside of the box, “Guaranteed to Bloom.” They must be pretty sure of themselves to make that kind of claim. I mean, why is this plant not blooming? Why did we get the “broken” plant? That’s when everything stops: my thoughts, my frustration, my anger. I realize that as parents we often have this unspoken idea of an imagined stamp across our newborn babies, “Guaranteed to Bloom.” Secretly, down deep, we all think that our children will come out perfect and ready to dazzle the world. I guess I was guilty of this too. It’s not something you want to readily admit, because you love your child so much that you never want to discount that. And it’s that love that propels you forward when you find out that something wasn’t quite right with your child. You tend to them every way you can. Just like giving the flower extra love, sun, and water; you give your child specialists, therapy, diets, prayers, hugs, tears, sleepless nights, and your soul if you could. I know, because I’ve done all of that. And Carson has made tremendous strides. He improves every year, but when compared to the others in his class, he’s stunted. He doesn’t bloom. So I sit on the floor and cry as I stare at the flower and ponder all of these thoughts. I let myself grieve over my failings, my weaknesses, his struggles. I grieve for the life I’m sure he’ll never have. The “simpler” life that I’ll never have. That’s when my second wave of realization hits me hard and puts everything in focus. This little green plant is a miracle and so is my son. Just like the plant, he has survived in a dark , scary box; a box called autism. He fought for his life from the beginning and even with ups and downs, he set roots and continued to grow. It was slower than the rest, but it was growth. He stood tall, withstood test after test; some medical and some more personal like the playground. He didn’t buckle, he didn’t wilt–he stood. He continues to stand everyday and continues to grow even though the naked eye of a stranger might not catch it. He is quiet and doesn’t cry over the injustices of his life. Even when looking at the three flowers and realizing he chose the “unlucky” one again, he just turns and goes on his way. Just like his plant, he doesn’t have any showy red blooms to flaunt or bring attention to himself, but maybe that’s what’s most beautiful about him. He’s survived and continues to do it everyday. Others might not see the invisible blossoms he carries: strength, perseverance, kindness, and love, but I do. To me, he’s the Amaryllis King. And I go on to think about my other two son’s and how amazing they are. I remind myself that they need just as much tending as Carson. Their own qualities mix to make an amazing bouquet and even their “weeds” of flaws make the arrangement more interesting. And my final realization is that for a person that completely lacks a green thumb, I have the most beautiful garden in the world. That was a great story, very touching to my heart. You are a great Mom to those boys and they love you. You are also a very talented writer. Love reading you storys. You’re right, we do expect our children to come out with a “guaranteed to bloom” stamp when really we should give them “completely permitted to fail” sticker. We expect too much from our kids and because of that, often we don’t give them the freedom to show us how fantastic they are. Great post! Thx. Absolutely beautiful, Ash. Just like your 3 babies. Thank you for your kind words, Sheila. I think people need to communicate more open and honestly about what they experience because it takes away the shame and has the potential to help somebody else. It’s hard being a parent and we need a community around us that understands.